Rugbrød (Danish rye bread) is a very commonly used bread in Denmark. 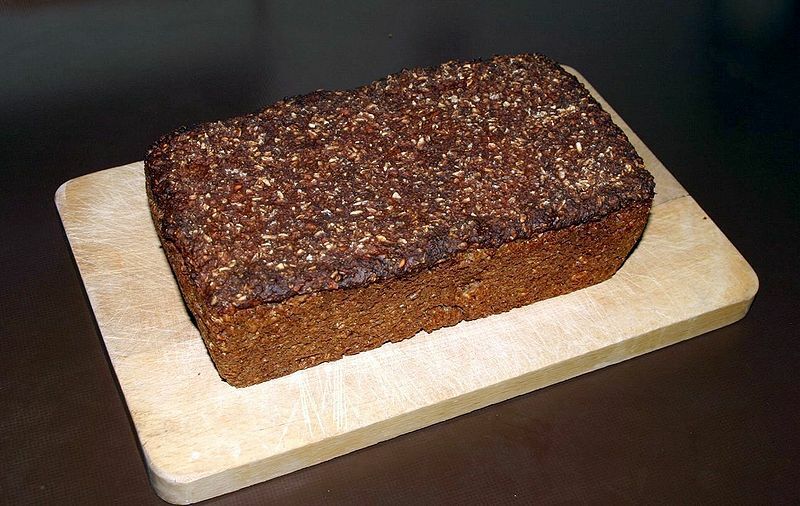 The common rugbrød usually resembles a long brown rectangle, no more than 12 cm high, and 30–35 cm wide, although shapes and sizes may vary, as well as the ingredients. Sourdough is almost always the base; the bread may be made exclusively with rye and wheat flour or contain up to one third whole rye grains. Variants with whole sunflower or other seeds also exist. The bread is always very low in fat, its content comparable to most other varieties of bread. It contains no oil or flavouring (except salt), although it will often contain preservatives to keep it fresh longer. While highly praised among Danes and also sometimes found in northern Germany, rugbrød has found little acceptance in other cultures, as it is often regarded by non-Danes as being too sour, too hard, or simply just unappealing to the eye. Conversely, one of the major complaints of many Danish expatriates is their inability to find acceptable local breads. Buttered rugbrød is essentially the base on which the famous Danish open sandwich smørrebrød is created.